I really can't believe I went as long as I did without owning a chambray shirt. I had wanted one for years and spent most of that time looking for the perfect one, then forgetting about it, and then searching once again whenever I would see someone wearing one. They really are one of those closet staples. They go with just about everything, can be dressed up or down... but you already know this so there's no sense in repeating it. I finally found my perfect chambray shirt early in the summer and have worn it about once a week since, mostly with shorts and skirts and summery things so I'm pretty excited to transition it into the fall. Yesterday I paired it with olive colored pants from Vince, ankle boots, and a messy bun that isn't visible in any of these photographs. Happy Tuesday and thank you so much for reading! Adorable look! I went forever without a chambray shirt too, but purchased one last spring after a girl in my office started wearing one that was seriously perfect. Love how they look with muted colors like olive or maroon! Your too cool. Great style as always. Love the olive pants and booties. They go well with chambray! Really cute look. Happy for you, the search is over. You found your perfect chambray. Oh my gosh, I STILL don't own a chambray shirt! I know that when I do finally buy one I'm going to be kicking myself for waiting so long! You are gorgeous and I love this outfit! LOVE these booties! Such a perfect fall look. 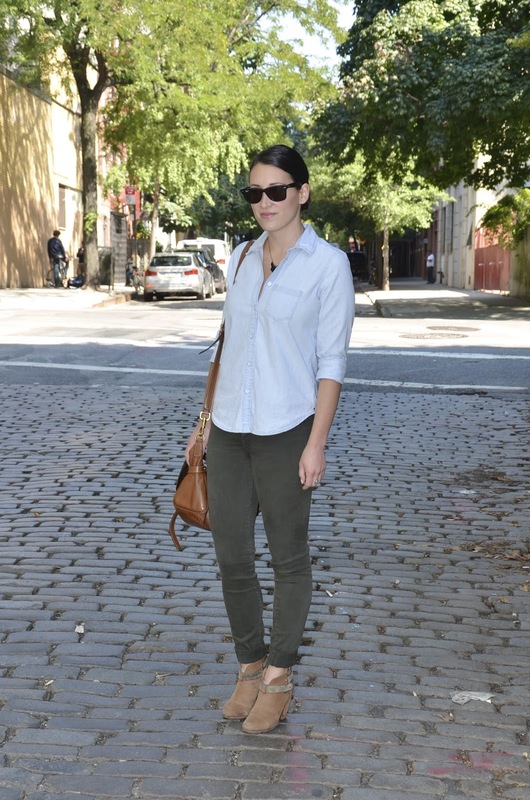 Love olive and chambray together! SO perfect! And those booties... gorgeous! Chambray shirts are pretty amazing, and anything cotton and from gap is great. You look lovely! I went for a while without a chambray shirt, too, because like you, I was looking for the perfect one. But now that I have one, I realize just how much styling opportunities I was missing out on! You can pair them with just about anything, and it instantly pulls your outfit together! Love how you paired yours with the olive pants and booties for a classic, cool look. My chambray shirt is one of my top wardrobe staples. I probably wear one once a week. Love it with the olive pants and booties! Such a perfect chambray shirt! You will wear it with everything! Love that you paired it with olive pants and these cute booties! I absolutely love this color combo! The black sunnies and sleek hair make it all the more chic! I am glad you bought into the whole chambray shirt thing! They literally do go with everything. and Especially those amazing olive colored pants! They are officially on my wish list! Fabulous dear! great casual ensemble! Love this look, perfectly put together, and I can't wait to try and create it for myself. Which is why I love your blog so much. Love everything about this outfit! Perfect for autumn! This outfit it perfect for fall!! Looks like a great way to transition such a staple as a chambray shirt!! Thanks for sharing! !